A light and airy, tastefully furnished room. 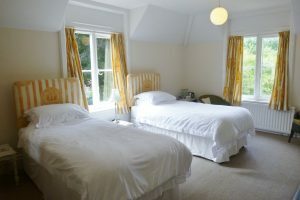 The Tyneham has comfortable beds, crisp cotton bed linen, with duvets and divine pillows, fluffy white towels, bathrobes, luxury toiletries, hospitality tray with choice of teas, coffee, biscuits and bottled water. TV/DVD player and hairdryer. The Kimmeridge, a comfortable stylish iron bedstead (5′ mattress). This room faces to the west, at the side of the property over looking the garden. Perfect for sitting in the bay window after a busy day of exploring with a glass of something chilled and watch the amazing sunset. Has small ensuite shower room. The Kimmeridge is light & airy and tastefully furnished. The room has comfortable bed, crisp cotton bed linen with cosy duvet and divine pillows, fluffy white towels, bathrobes, luxury toiletries, hospitality tray with choice of teas, coffee, biscuits and bottled water. TV/dvd player and hairdryer. Min 2 night stay, min 3 night stay at bank holidays. On occasions 1 night stays are available dependant on diary and are charged at £25 extra on the normal nightly rate.